A Christian funeral is a difficult, yet reverent, mix of grief and joy. Joy, because we are confident in the promise of God that “neither death, nor life, nor angels, nor rulers, nor things present, nor things to come, nor powers, nor height, nor depth, nor anything else in all creation, will be able to separate us from the love of God in Christ Jesus our Lord.” Consequently, the liturgy for the dead is properly an Easter Liturgy. It finds all meaning in the resurrection. Because Jesus was raised from the dead, we too, shall be raised. Such joy, however, does not make our grief unchristian. Quite the contrary, our grief is an expression of our love. The very love we have for each other in Christ brings deep sorrow when we are parted by death. Jesus himself wept at the grave of his friend. So, while we rejoice that one we love has entered into the nearer presence of our Lord, we sorrow in sympathy with those who mourn. At the time of death, people turn to the Church for rituals which allow them to recognize their loss, express their grief, remember and give thanks for the life of the one who has died, mark the end of relationships which exist in this life, allow them to seek strength and comfort in their faith, and provide dignity and meaning to the end of life. The rites of the Church are appropriate at several junctures in the passage from life into death. Long before death is a reality, the church can help people plan for the funeral and address other issues and concerns. Near the point of death, the Church can be present in a ministry to the dying person and his or her family and friends. After death, there is the funeral service and committal of the body to a final resting place. At Saint Michael, our clergy, staff, and lay volunteers will do all that we can to provide a fitting and meaning filled funeral for your loved one. We recognize that, upon the death of one we love, there are many arrangements to be made and concerns to be settled. Therefore, we will strive to make your experience here as easy and well-supported as possible. Please call the Priest on Call for Saint Michael and All Angels Church at 214/232-7512 to report a death. The Priest on Call is available 24 hours a day and is the most direct way to receive pastoral care at the time of death. The Priest on Call will make preliminary arrangements and contact the staff. The Associate for Worship and Liturgy will be the main contact in planning your loved one’s service. All funerals are services in thankful memory for the life of the deceased. The Book of Common Prayer states that the body (casket or ashes) will be present for this thanksgiving. 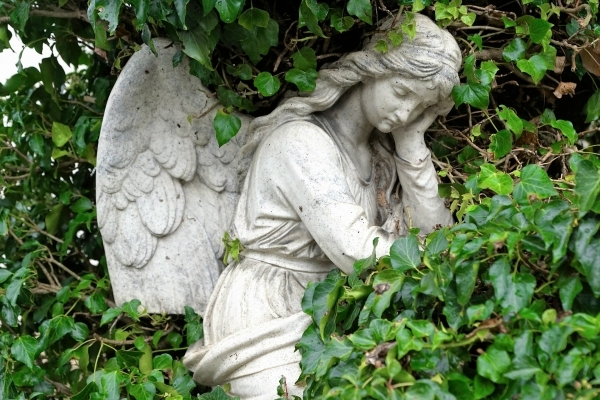 Saint Michael clergy and those who have accomplished serious training on the reality of grief agree that this not only provides a way to honor the dead, but also begins the process of accepting the reality of death and a movement toward the healing of grief. Nonetheless, please know that a Memorial Service, the Burial Office without casket or ashes, is also acceptable. The Book of Common Prayer prescribes that the coffin or urn be covered with a pall (an embroidered cloth provided by the parish) during the service. The use of the pall symbolizes a great truth at the heart of the church’s ministry: that we are all equal in God’s sight. Over the years, a pall has covered the remains of the celebrated and the unknown, each of whom is loved by God. If flowers or a flag is covering the casket when it arrives in the Narthex, the Altar Guild respectfully removes the covering for the service and replaces it as the casket is taken from the Church/Chapel. After the time of the service has been set by the family and the priest, the Flower Guild Chair will contact the family regarding their wishes about the service flowers. No extra adornment of flowers, pictures or mementoes are allowed in the Narthex or any worship space of the Church/Chapel. They may be placed in the area of the reception. If the family wishes the altar to be bare with no flowers at all, that is also an option. Funeral flowers remain in the church after the service. Music makes a vast contribution to the richness and meaning of the service. A parish organist is available to play for funerals and is available to make any other music arrangements. If desired, a soloist, a choir, and/or instrumentalists are available for an extra fee. Hymns are strongly encouraged from The Hymnal 1982 to be included in the design of the service as congregational singing helps in the grieving process and allow one to participate more fully in the service. Listed in this document are suitable hymns which may be sung at appropriate points in the service. Only sacred music (music written for Christian worship) is allowed. The Burial Office generally includes four lessons, one from the Old Testament, one from the Psalms, one from the Epistles, and one from the Gospels. One or two Psalms may be used after one or more of the lessons. They may be said by the whole congregation in unison or read by a reader designated by the family. Non-scriptural readings are generally discouraged. However, readings which relate to the sacred may be used, but only after consultation with and permission from the officiating clergy. Scriptural suggestions are included with this document. Following the reading of the Gospel lesson, a homily (a brief sermon) is preached by one of the officiating clergy in consultation with the family. The homily in Christian traditions grows both out of the lessons chosen for the service and the life of the deceased. In the service, we come together before God with our grief, our questions, our hopes, and our most valued feelings as Christians. Thus, to bring together the life of the deceased with the hope of the Church, it is especially important for family members and friends to share with the officiating clergy those aspects of the deceased’s life for which we are giving thanks. A brief reflection (no longer than five minutes) may be offered by a pre-arranged family member or friend. The best reflections are written in advance and help those gathered to remember the best character qualities of the deceased—the ways in which the person helped family and friends see God’s love and grace. Approximately a half hour prior to the service, family and close friends are asked to gather in the Parlor. After being greeted by the officiating clergy, they will be conducted to the front seats of the Chapel or Church by the officiating clergy or a Parish Verger. At the conclusion of the service, family and friends in the front of the Church are escorted out, in advance of the congregation’s departure. On occasion, a family may choose to process down the middle aisle behind the casket or cremains. For a copy of our Funeral Guide, click here. From ancient times, Christians have considered places of burial to be sacred sites where the departed are remembered and honored. They are places for quiet remembrance, for prayer, for families and loved ones to gather. They are places of peace. The fees detailed below simply cover the various expenses. A traditional Rite I or II Eucharist, according to the day, is held each Tuesday and Thursday in the Bishop Moore Chapel. At the Celebrant’s discretion, a short homily may be given. The Daily Office of Morning Prayer is held each Monday, Wednesday, and Friday in the Bishop Moore Chapel. Join in this practice of daily prayer as it perfectly expresses our religious identity. As Augustine said, the Daily Office helps us “become what we are” – baptized men and women. This service is lay-led and uses the Book of Common Prayer. A member of the clergy officiates at a service for healing with Eucharist in the Bishop Moore Chapel each Wednesday at 10 a.m. The sacrament of Unction is offered to all who desire it. This service uses the Book of Common Prayer and special prayers for healing. 8:30 a.m. Eucharist Bishop Moore Chapel A traditional Rite I Eucharist is held each Saturday at 8:30 a.m. At the Celebrant’s discretion, a short homily may be given. This service uses the Book of Common Prayer. The Candlelight Mass is a modified Rite II Eucharist held on Saturday evenings, typically in Saint Michael Chapel (location may change on occasion to the Church due to a wedding). This “come-as-you-are” service is reflective and contemplative with guitar and keyboard accompaniment. This service uses a special service leaflet.